The Gemco 1995A Series Programmable Limit Switch (PLS) was designed for use in rotary application. It incorporates many features for safe, efficient operation. The completely self-contained PLS can operate up to 30 independent mechanical relay outputs (six standard) based on the rotary position of the resolver. 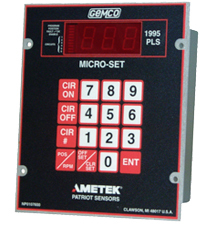 It offers an on-line "fault check" that provide an automatic, in process mechanism to verify that all major programmable limit switch functions are operating properly. This unit can be used with our Series 1986 Resolver Assembly.